Kataphraktoi are the elite of the elite. They stand a bit higher than their now extinct brethren “Klibinarioi”, as they are even more highly armored. Klibinarioi had 4 layers of armor (“esolorikon” padded cloth gambeson, “lorikon” scale or mail hauberk that can reach up to the eyes, “klibanion” lamellar cuirass and “epilorikion” quilted cloth gambeson over that). Kataphraktoi best them by using an extra layer of padding to prevent the blunt trauma that will occur, leading to possibly the most armored horsmen of that period. The lamellar klibanion they wore also covered the upper half of the cavalrymen’s arms with lamellar and shoulder plates combining together, and on top of that the quilted cloth armor, the epilorikion to blunt the power of mace like weapons. A mail or scale gorget would be used to protect the neck. Forearms and lower legs would be protected by lamellar pieces interlocking with each other. Hand pieces are called “cheiropsella”, and foot ones “podopsella”. A small shield is also worn mainly for left hand protection, but it is not really needed, as very few things can penetrate those armor layers. Still, all those armor layers had a price. It must have been hot as hell to wear one of those, though. It is no wonder that one of the unit’s armor, “klibanion” lamellar armor means “furnace”. “Klibanos” still means furnace in present day greek. Not many of the Stratiotai or Kavallarioi would be able to withstand such a weight and fight with the mace at the same time. Hence the importance the empire gave to them. Roman ingenuity armed them with close range sharp headed javelins as a way to soften the enemy a bit before hitting them with the hardest force in all of the Roman arsenal. They enter the fight after shooting off their javelins but they don’t charge to break through. They attack and stay there, smashing the enemy with their vardoukion/apelatikion/siderorabdion heavy mace. Those who oppose them would have to slash through 5 layers of armor and padding to hurt them, and that could be difficult. Kataphraktoi, along with their long gone cousins Klibinarioi passed from being the top of the line in Roman cavalry to being a memory, as the empire had to field lighter cavalry to keep up with the invading and ever moving armies of the Arabs, who conquered the biggest part of what used to be part of the Roman Empire. As the Romans came to grips with this threat, for nearly two centuries they counterattacked reaching present day N. Syria, N. Iraq, and Armenia. The spearhead of this assault was the Kataphraktoi. Later on, Turk conquest of the Mikrasia, to be called Anatolia from now on, deprived the resources and estates needed to field such troops, and made only “dynatoi” big landlords, able to field horsemen equipped as such. 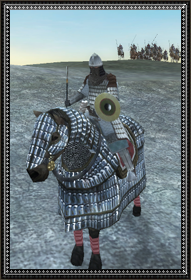 Those “dynatoi” meaning “powerful” can choose not to join the army themselves but rather sponsor a cavalryman to join in their stead by providing a warhorse and all the equipment. A Kataphraktos isn’t a charger. He is a thrasher, moving in and start smashing and killing until there are no more enemies, or they flee, or he is ordered to depart. In fact according to tactical manuals of the Roman army, the Kataphraktoi aim was to break the center of the enemy front and cause their enemies to flee. Once that would happen, lighter cavalry (That would be Hosarioi and Stratiotai) which was many times their number would pursue and destroy the fleeing enemy troops. Kataphraktoi were a rarity though. A big Roman expeditionary force would normally be comprised of 16.000 infantry, 8.000 light and medium cavalry and only 500 Kataphraktoi. Very few in number, but “happy few” as Shakespeare would say, who really did turn the battle around.